Many people hear the term “Oxygen Sensor” and figure it must have something to do with sensing oxygen, but don’t really know much beyond that. Let’s break it down: your vehicle has an oxygen sensor in the exhaust manifold that measures how much unburned oxygen there is in the exhaust. The sensor reports its findings to the engine control unit (ECU), which knows how much oxygen there should be in the exhaust. Based on that information, the ECU will adjust the amount of fuel it sends to the engine. This feedback and adjustment loop continues non-stop. The goal is to have the optimal air to fuel ratio for performance, efficiency, and to lower harmful emissions. 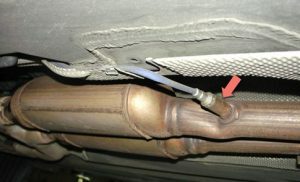 There is a second oxygen sensor located in the exhaust pipe behind the catalytic converter. It too measures the amount of oxygen in the exhaust, after it has been treated by the catalytic converter. As the measurement is reported back to the ECU, the computer compares the oxygen levels before and after the catalytic converter to determine if the converter is still functioning properly. So, 4-cylinder vehicles have two oxygen sensors. V-6 and V-8 engines have four sensors, two for each bank of cylinders. As you can imagine, the oxygen sensor lives and functions in a pretty hot environment so they will wear out over time. Substances in the exhaust can also damage them leading to failure. Outside elements like water and road salt can corrode an oxygen sensor and when the sensor goes bad it needs to be replaced. You may be interested to know that oxygen sensors are often replaced needlessly. When the oxygen sensor returns a measurement that is out of the specified range, it may trigger a trouble code in the ECU and the check engine light is illuminated. Inexperienced do-it-yourselfers or part store employees may misinterpret a trouble code that reports an out of range sensor reading. That could mean that the sensor is bad, but it could also mean that the sensor is accurately reporting a condition caused by some other malfunction. A skilled diagnostician can sort this out and will only replace the oxygen sensor when it has truly gone bad. When you have a check engine light come on and stay on, it’s good advice to have it checked out by a qualified service technician at Express Car Care. The cause may be minor or quite significant, so it’s best to play it safe and let the professionals check it out.